Yes, you read that correctly! iMovie includes a Movie Trailer feature that can turn your MacBook film clips into a Hollywood-class preview, complete with the works, including genre transitions and background music. Choose File→New Project or press cmd+N. Select the aspect ratio for your movie. Click a Movie Trailer thumbnail to select it. iMovie displays a nifty preview of the selected trailer style. Click the thumbnails to preview their look before you make your decision. Naturally, you’ll want to choose a trailer style that most closely matches the mood you want to project with your movie. Each trailer has a suggested number of cast members; this number reflects the number of people that will appear in the clip placeholders during the editing process. 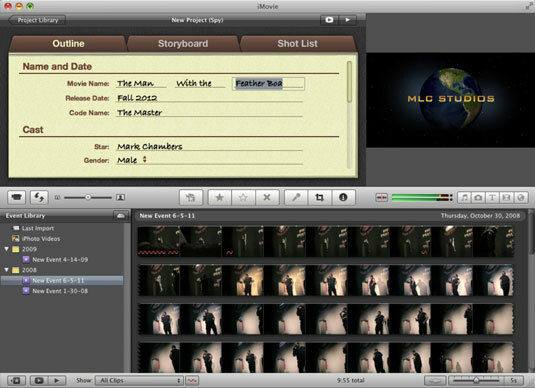 iMovie replaces the Project Library pane with the Trailer pane. On the Outline tab, you can edit the titles used in the trailer. The pop-up lists allow you to add information such as the gender of the star(s) and the logo style you want for your “studio” at the beginning of the trailer. To change a text field, click in it and type the new text. You’ll see the changes you make in the Trailer display appear in the monitor in real time. After you complete your edits to the titles, click the Storyboard tab. There, you can edit the text for each transition; simply click the text to display the edit box and type. You can also drag clips from your Event Library (or from a Finder window) to fill the storyboard’s placeholders for video clips. To delete a clip from the storyboard, click it to select it and then press Delete. The Storyboard tab might not look like an editing timeline, but you can move the cursor anywhere within the storyboard to preview your trailer. The playhead indicator appears wherever the cursor appears, allowing you to watch the clip or transition that it’s resting on. You’ll soon be sweeping your mouse to the left or right to move through each section of your trailer. For an overall listing of each clip required for the full trailer, click the Shot List tab. On this tab, clips are organized by type. For example, all the action clips appear in one section, and all the landscape and close-up clips are grouped together as well. If necessary, you can also add, delete, or swap video clips from the Shot List. After you’re satisfied with your finished trailer — or if you’d like to work on another project — click the Project Library button at the top of the Trailer pane, and you’ll see that iMovie has added your trailer as a new project in the Library list.